The name of the new era was announced last week on 1 April 2019, a month before it starts on 1 May following the formal abdication of Emperor Akihito the previous day. So, after 30 years, Heisei will come to an end and Reiwa will start. There was a slight confusion over the kanji for the new ‘reiwa’ (令和). A friend thought the first one was written (冷) meaning cool or cold, rather than (令) which has a meaning of order or command. If the former, then the new name could mean ‘Cold Peace’ or even ‘Cool Japan! In which case we could be welcoming a new era in sharp contrast to the War years during the Showa era of Emperor Hirohito (1926 – 1989.) But what’s in a name? To the Japanese quite a lot it seems as the announcement was met by cheers and tears, and bewilderment as many struggled to find a deeper meaning in the words. The nationalistic Government has explained that the characters were chosen from a passage in ‘‘Manyoshu’’, Japan’s oldest known poetry anthology; this breaks with the long tradition of using Chinese classics as the source. 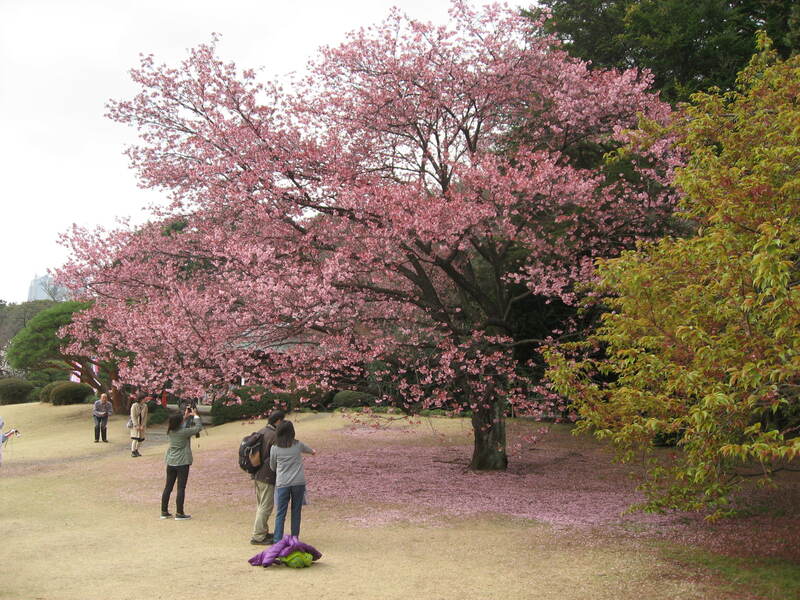 The change was announced in the week in which the cherry blossom was in full bloom. As usual the crowds were out in force sipping sake under the sakura in the parks and anyway the blossom could be soon for the annual hanami festival. Emperor Akihito and Empress Michiko are known to take a private constitutional early in the morning in the inner Garden of the Imperial Palace. 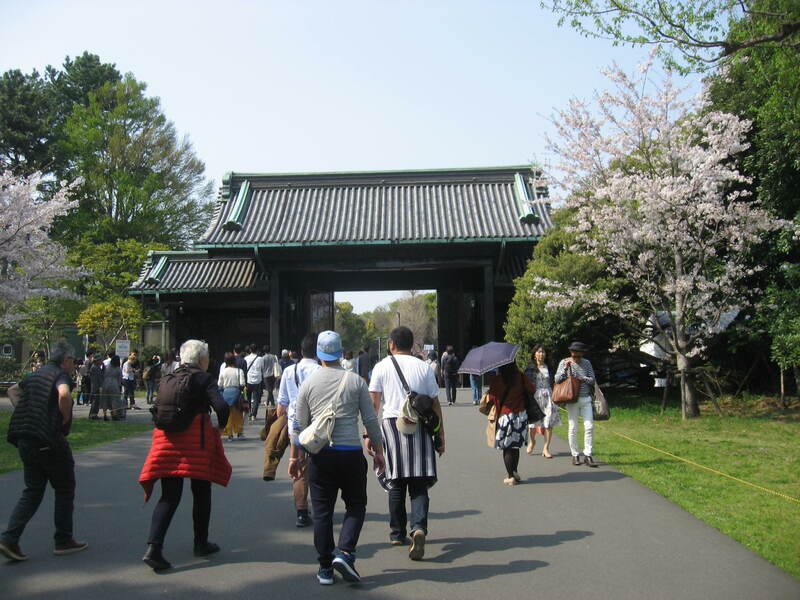 On Sunday however, they couple left for a brief stroll outside the palace much to the surprise and delight of pedestrians and the joggers for whom an outer 5km circuit of the palace moat is one of the favourite running courses in Tokyo. This will be their last chance to participate in this ritual as they will move out soon swapping palaces with their son, Crown Prince Naruhito who will succeed to the Chrysanthemum Throne. 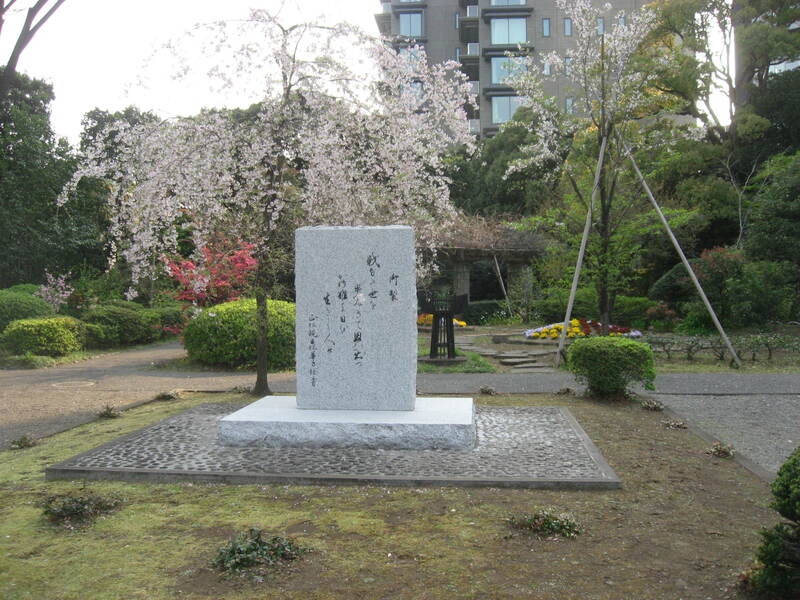 But hanami is touched with sadness as it is short-lived. Within a week or 10 days the blossoms begin to fall reminding us of how our own hold on life can be beautiful but tenuous and that we need to live for the day, so on Sunday for the last open day of the Heisei era we joined the crowds on a beautiful spring day to enjoy the privilege of the blooms in the palace grounds before they disappear. 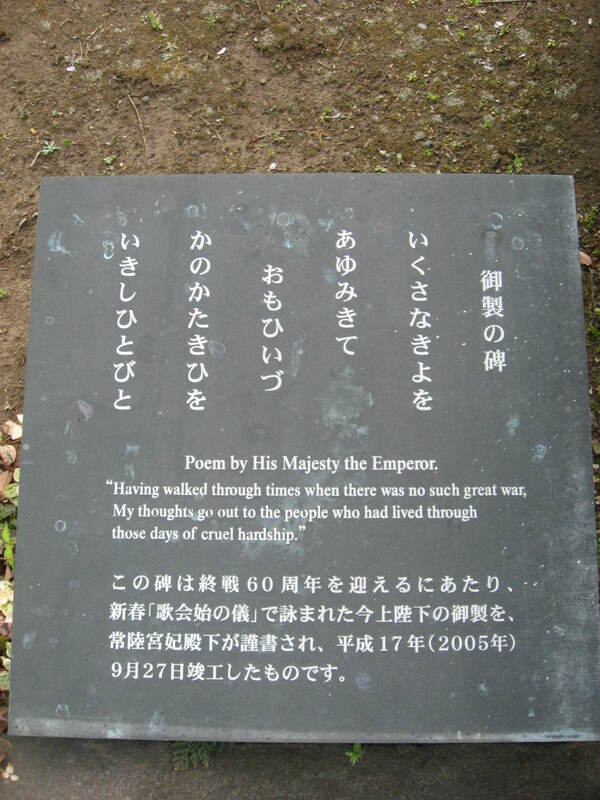 and for the first time into the national cemetery where a monument bears a poem written by the Emperor which translated reads: ’Having walked through times when there was no such great war, my thoughts go out to the people who have lived through the days of cruel hardship’. This is a recurring theme of his as he reflects on his reign and perhaps looks forward to a long, well-deserved peaceful retirement. Yesterday (18 September) was ‘Respect for the Aged Day’ in Japan, a public holiday to honour the senior citizens in the country. There’s certainly a lot of them to respect here, as Government figures released at the weekend show that the number of people aged 65 or over is ½ million more than this time last year bringing the total to over 35 million and accounting for nearly 30% of the population. The ageing population is certainly a problem with which the government and society is struggling to cope. More than 2 million people are 90 years old or older, and topping the list has to be Nabi Tajima who has just been verified as the world’s oldest living person at the grand old age of 117 years following the sad passing at the weekend of Jamaican, Violet Brown, also 117. Japanese often credit their advanced years to a healthy diet, so I’m hoping that, having lived here for more than 10 years now, some of that may rub off on me. Although not yet old enough to be included in the statistics, I passed my own milestone earlier this year. Kanreki is a celebration held on a man’s 60th birthday. ‘Kan’ means return and ‘reki’ means “calendar.” At 60, according to the Chinese zodiac, a person has returned to the calendar sign under which they were born. As the colour red in Japan symbolises babies, it is customary for men especially to undergo the ritual humiliation of donning a red hat and jacket on their 60th birthday to celebrate their re-birth. To which I would add ‘…yet’! As I failed to write a new year greeting at the beginning of 2017, I’m making amends by doing so at the start of the Chinese New Year, as the Year of the Rooster starts today. This year is my year! We Fire Roosters are meant to be ’Trustworthy, with a strong sense of timekeeping and responsibility at work’ but don’t believe everything you read. Back at the start of the calendar year there were the usual queues to get to the shrines for hatsumōde 初詣, the first visit of the year, and nearby Meiji Shrine is a focal point in central Tokyo with crowds prepared to wait for an hour or more at midnight of 31st December. Also at Meiji Shrine, in the first week of the year the yokozuna (Grand Champion) sumo wrestlers brave the cold to perform, with much foot stamping the entering the ring ceremony before the start of the January tournament. Just up the road in the Tokyo Opera City complex, another cultural event took place this year. Normally seen in the summer months, especially in Harajuku, a local group put on a yosakoi traditional dance performance. Yesterday I had my new year pilgrimage to Kamakura for my own supplications where there is a very wide choice of shrines and temples at which to do so. It was the first time for me to visit Eishoji temple, the only remaining nunnery in Kamakura and off the main temple trail. With its architecture and peaceful bamboo garden I was able to face the Year of the Rooster suitably relaxed in a very spiritual setting. So whichever new year you are celebrating, and with whichever cultural events you choose to celebrate it, may I wish you a very happy and prosperous one with my own resolution to write more, and more often. 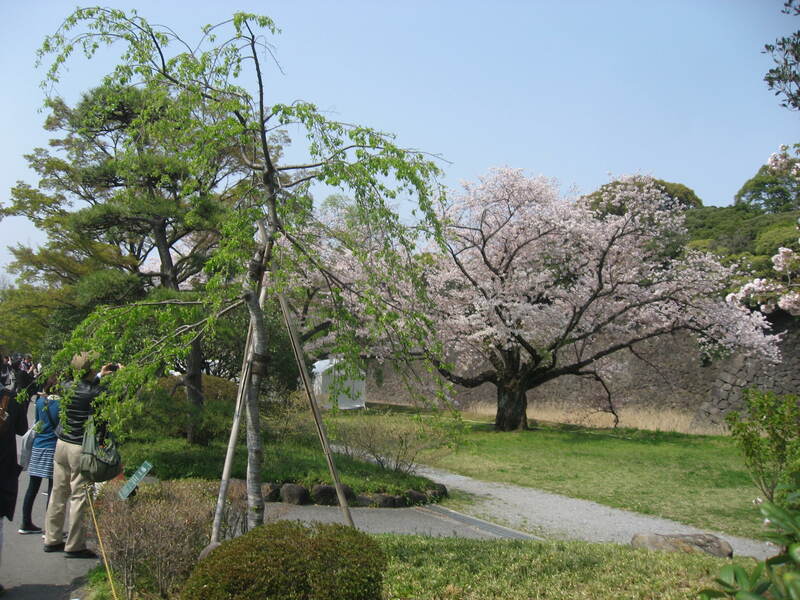 The Japanese have long had a fascination with English gardens. For a country where few properties have enough space for a private garden, many people indulge their passion by visiting one of the many gardens and parks laid out in what is considered to be the English style. 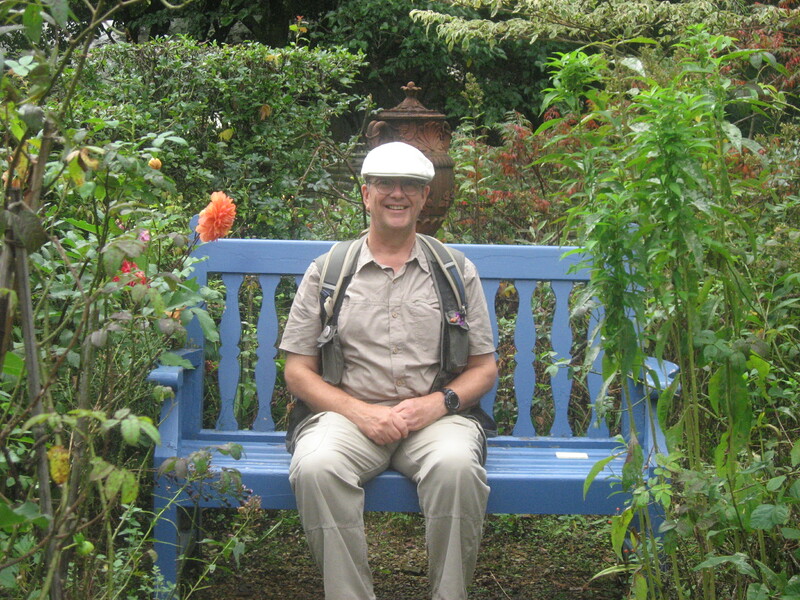 Although, like many of the so-called British pubs here, the attempts to recreate a little bit of England, don’t always work, I was very impressed by the Barakura English Garden near Chino in Nagano Prefecture. Co-designed by horticulturalist Kay Yamada who has won medals for her garden designs at the Chelsea Flower Show, Barakura was opened in 1990. 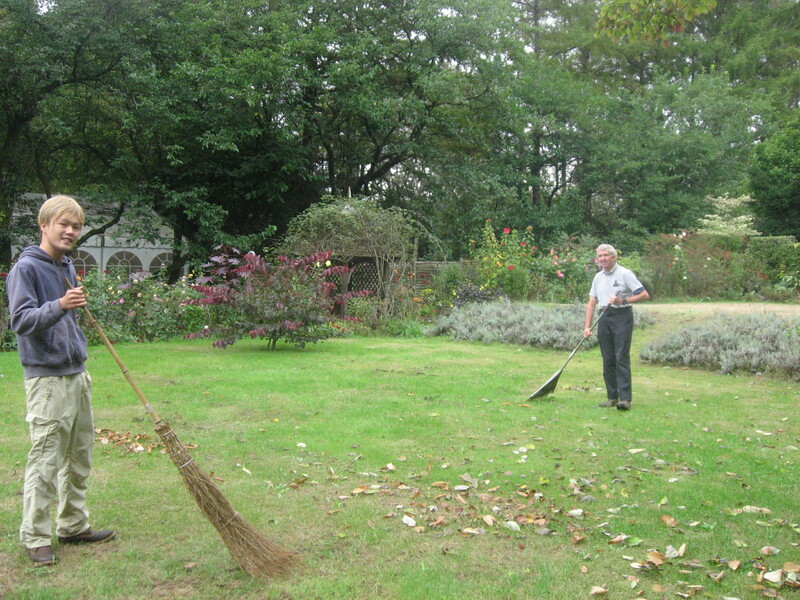 Under the care of Head Gardener Andy Fisher, originally from Cumbria, there really is an authentic English atmosphere. 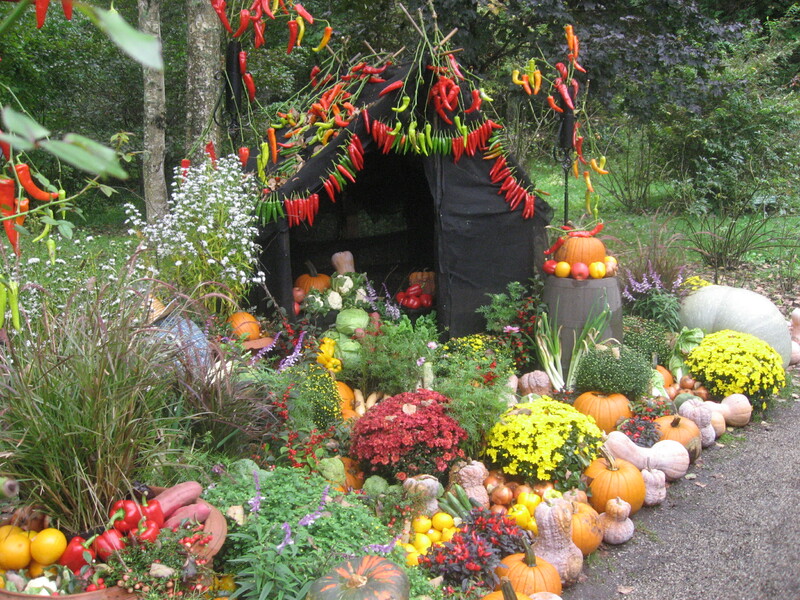 Even more so as when I first went this weekend a background of light rain created the perfect setting for the autumn festival with displays of vegetables not normally seen in Japan. But they were not only on display as on the lunch-time menu was butter-nut squash soup and a Cornish pasty as well as a selection of home made cakes and desserts. This weekend was even more special with the Royal Marines Concert Band playing a series of sets of mainly British patriotic music as part of this year’s celebrations of Her Majesty’s 90th birthday with well-known music from the shows such as ‘Oliver’ and TV theme tunes ‘Black Beauty’ and ‘Sailing’. The latter was not the only nautical number as they also played some well known sea shanties. 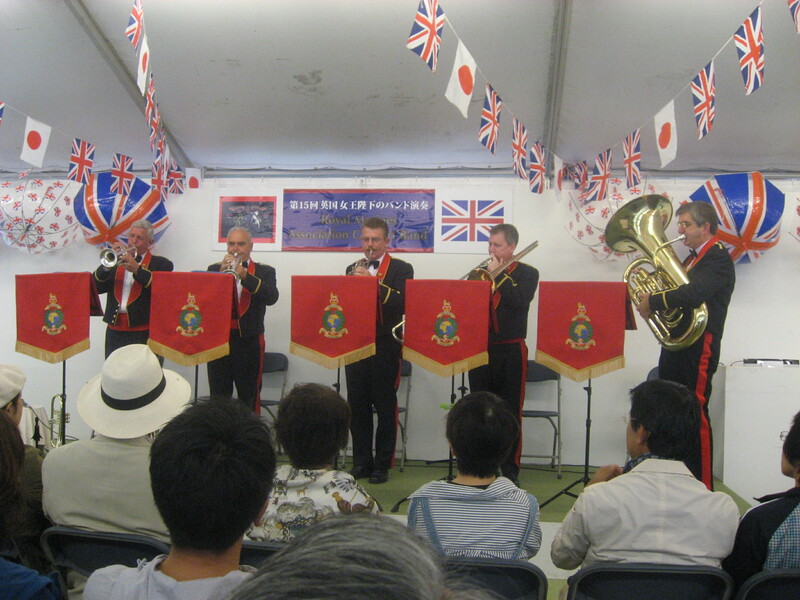 The finale on the last day of course included Vaughan Williams’ Sea Songs; a rousing ‘Rule Britannia’ and ‘Land of Hope and Glory’ brought their annual ‘English country gardens’ visit to Japan to a close. Today (3 February) is Setsubun (節分) in Japan, the day before the start of spring and a day in which it is traditional to cast out the devil and encourage good luck for the year ahead. This is celebrated in many ways throughout the country. One of the most popular is to gather at a local shrine for mamemaki where small packets of roasted soya beans will be thrown in to the waiting crowds to cries of Oni wa soto, fuku wa uchi (‘Out with the devil, in with good luck’) and the more beans you can catch the greater your luck (or so they say). At the more famous shrines, the bean tossing is often carried out by well-known sportspeople such as sumo wrestlers dressed in traditional garb, as well as TV personalities or minor celebrities (known, incongruously, as talent-o in Japanese). My local small shrine at Yoyogi Hachiman does not warrant such exalted attention, but the crowds gathered there all the same for the ceremony. This is taken very seriously, and as they waited I could see people demonstrating their catching techniques while others were content to hold open large carrier bags to collect the lucky beans. the line-up of local officials and politicians assembled on the podium and were introduced to the crowd before they launched the lucky packets. It seemed to me that the older and smaller one was, the more determined one became in trying to grab a piece of seasonal luck; for once Japanese traditional decorum and discipline were abandoned. Perhaps Eddie Jones, the former coach of the Japanese ‘Brave Blossoms’ rugby team who did so well in last year’s World Cup, should draw some lessons from the scrum techniques of Yoyogi’s Grappling Grannies, as he now hopes to take England to success in the forthcoming Six Nations Championship. Certainly they need more luck than I had today as I had to be content just with a few photos of this cultural curiosity. In Japan, dogs don’t go “woof woof” they go “wan wan”. So on 1st November, 1.11 or ‘one. one one’ with some allowance for pronunciation, it’s not surprising that it was a day for celebrating one’s pooches. In the late 1970s when I first came to Japan we English were known as, or accused of, being dog-lovers. However since I returned nearly 10 years ago I’ve noticed a proliferation of facilities for man’s best friend. Or should that be man’s best wan? 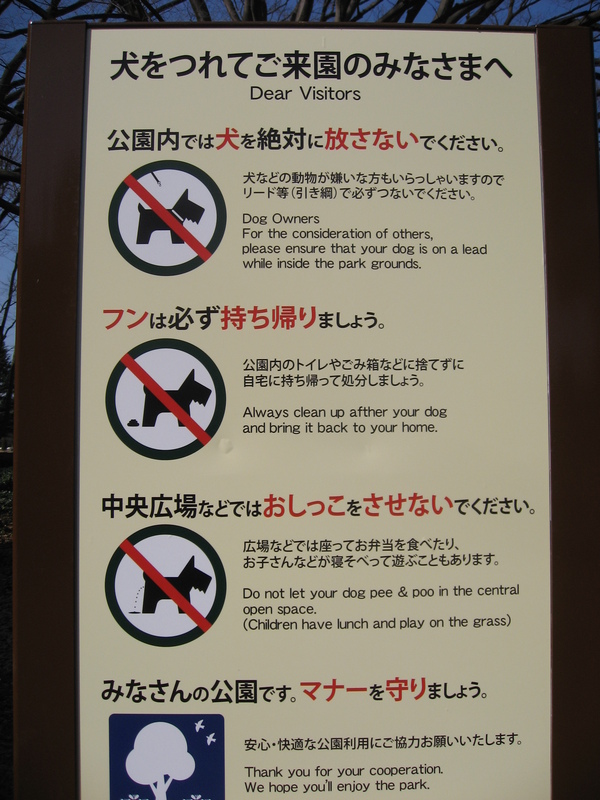 Yoyogi Park even has a dedicated dog run where those who register their pets can let them run free and socialise with their canine cousins. They are segregated according to weight though to avoid playground bullying of the dachshunds by the Dobermans (or vice versa maybe). 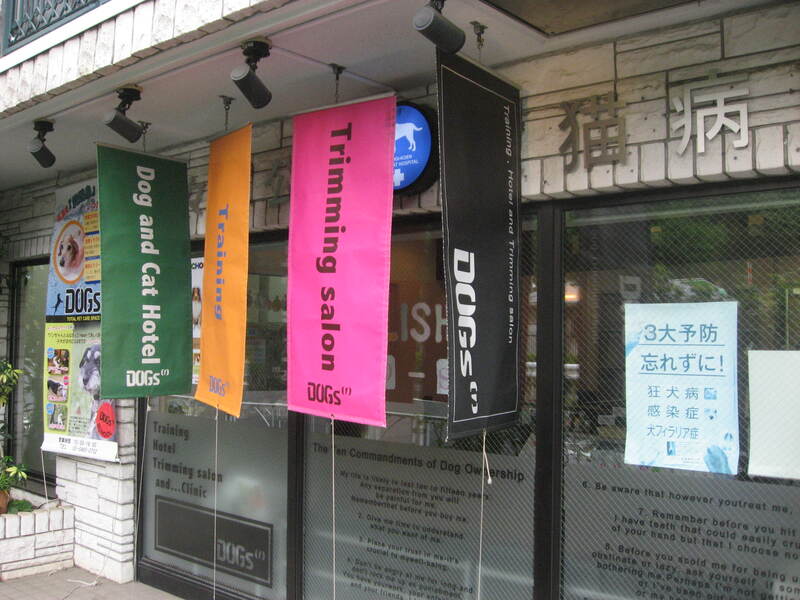 Near to the Sangubashi entrance to the Park is a row of poodle parlours and hound hotels for when your pet needs pampering. “In a lovely pet for you (owner), the animal of the dog etc. comes and feeling that it is scary hated one also comes. Tie firmly by the leash (dragrope) etc., and never pasture it in the park”! I was also told that 1st November was national sushi day. So let’s hope the two occasions were kept firmly apart. 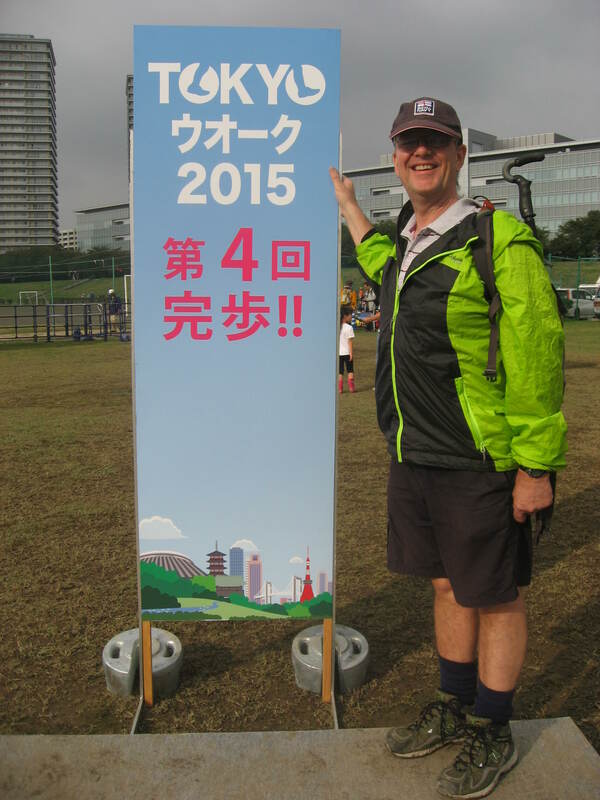 Mid –October and a weekend outdoors .On Saturday we took part in our first walk organised by the Tokyo Metropolitan Government. with choices of distance ranging from 8km through to 45km. We played safe and signed up for the B course at 15km. Held out in the suburbs along the Tamagawa river, we had an early-ish start (for a Saturday) for the 30 minute train ride to Shimomaruko station from where a10 minute warm –up took us to the start and registration to face card stamping, form filling and collecting bags filled with copious amounts of advertising material. The first half of the walk was through the town and on to Denenchofu. Despite the fact that it was a quiet morning traffic wise and there were very few cars on the side roads the Japanese walkers obeyed every pedestrian light without fail. They preferred to bunch up at a car-free crossing waiting patiently for the lights to change rather than nipping across an empty road to avoid breaking their stride. With few public toilets along the way we had to have an extended break in a very crowded convenience store to use the conveniences, and I bought an appropriately named Slow-bar to boost my energy while queuing. 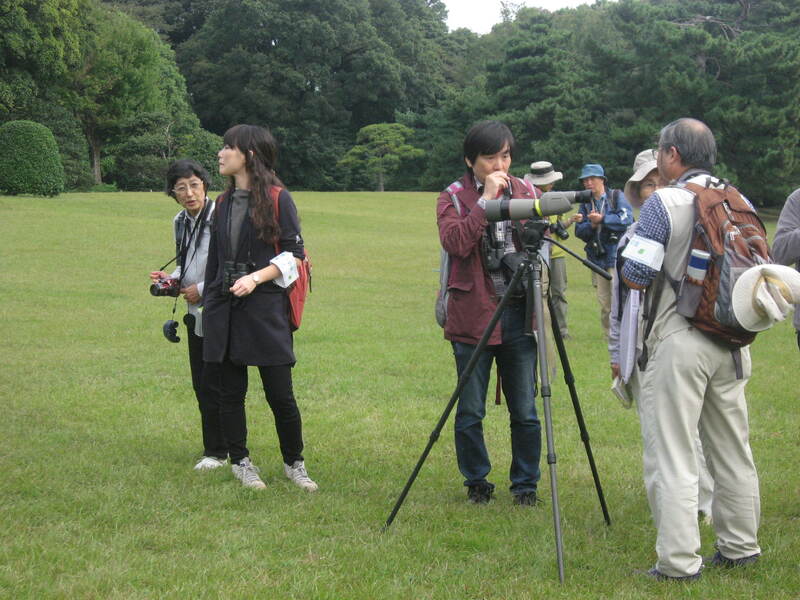 This morning was a much more sedate event with the Japan Bird Society’s monthly outing to the grounds of Meiji Shrine. About one hundred binocular and telescope bearing twitchers turned up to wander through the forests and lawns trying to spot something eye-catching or just unusual. For the former we were blessed with a couple of sightings of a kingfisher. A grey-streaked or spotted breasted, depending on which book you consult, flycatcher created great excitement as they’re usually only found in Hokkaido. I was told that this one was probably migrating south to escape the colder weather which has already arrived in the northern island. And, yes, I was still wearing shorts, but not seen here. 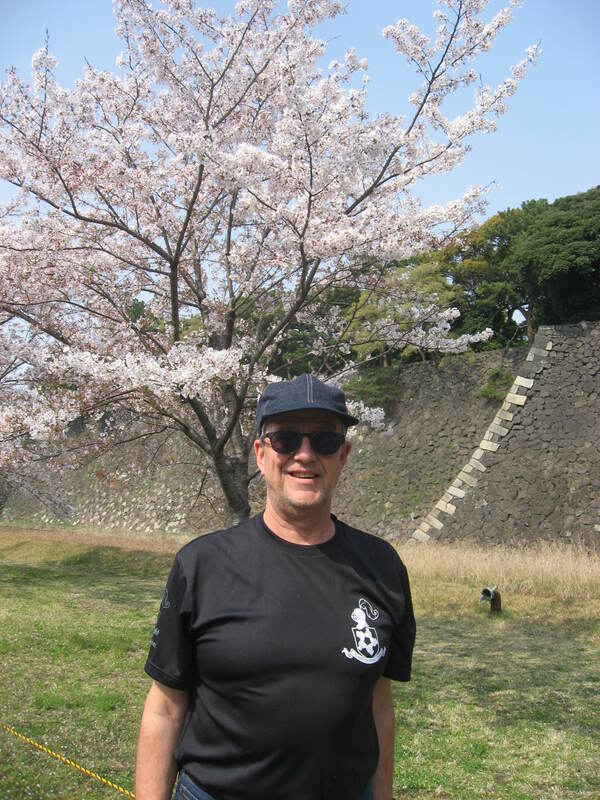 Five months ago today I slipped in the rain and twisted my right ankle quite badly outside Yotsuya Station in central Tokyo, one hour in to an 80 minute walk to a cherry blossom viewing party. Being a True Brit I got up and carried on for the final 20 minutes to meet former colleagues at the British Embassy. With hindsight that was not sensible as the ankle became very painful and swollen as the party progressed. 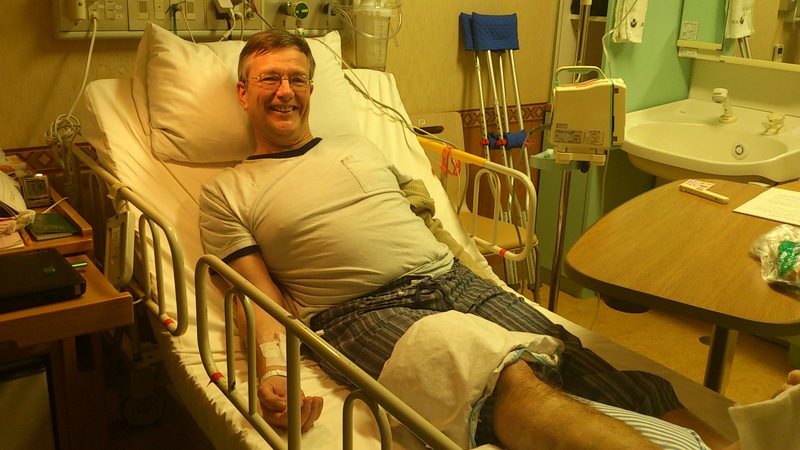 The next day I went to the local sports injuries clinic to be told I’d fractured my fibula and that it would probably need surgery, so was referred to the local JR General Hospital. A day of X-rays and tests revealed that to be the case and I was admitted the same week. An existing medical condition meant that I had to spend five days in hospital before the op which I was told could be performed under epidural and that I could listen to my iPod during the procedure. Of course I chose Eric Clapton to see me through. When the op was under way, and I was in to his Greatest Hits, Dr Iwashina asked me if I wanted some sedation. I’m not sure how serious they thought I was when I joined in with the refrain to ‘Cocaine’!! A few months of rehabilitation and periods in a wheel chair progressing to crutches followed, and finally in the middle of June I was allowed to walk unaided again. I must admit though to choosing to use a walking stick initially for support and stability, to get a priority seat on crowded trains, but mainly because it enhanced the elegant Englishman image. This week I celebrated further progress as Dr I told me I could start jogging again. “OK, I’ll start gently” I reassured her. “No, you can do hard” she replied. So this morning my first trial around Yoyogi Park. I confess to walking the slopes both up and down, and to not tagging on to the back of the packs of Club runners out enjoying the unseasonal slightly cooler weather. When a pair of speed-walkers shimmied past me I realised that I have a lot of training in front of me before I’m back up to full fitness again. 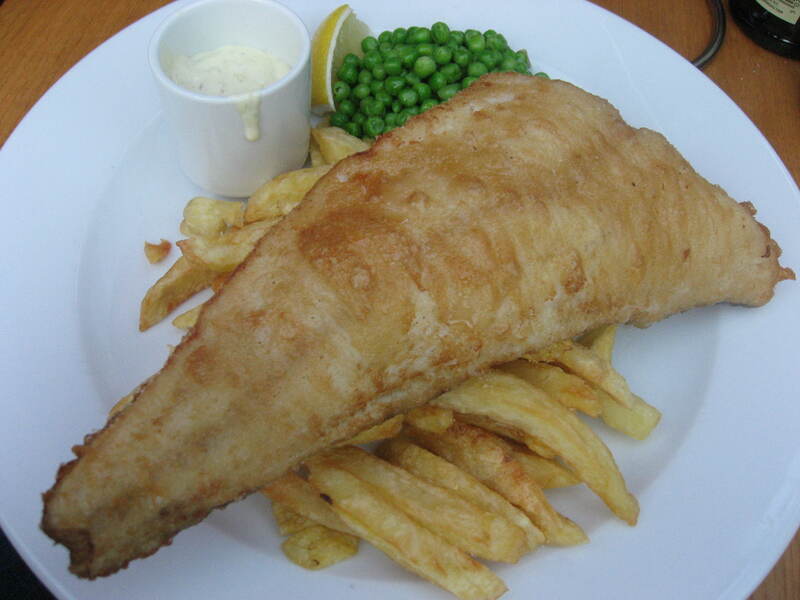 I’ll also have to work off those extra kilos gained eating too much English food during my summer holidays back home. But the euphoria of actually being out again had me wondering whether I could actually do another marathon before I hit 60? Watch this space! There’s an obsession with flying things in Japan at the moment. The drones have landed – but not where they should! It all started when one landed on the roof of Prime Minister Abe’s office. That one was worrying as it had a container attached with the radio-active symbol on it and actually contained contaminated soil from the Fukushima area. The perpetrator has now been arrested and charged with ‘forcible obstruction of business at the Prime Minister’s office’. He said that he was protesting about the Government’s nuclear policy and was inspired to use a drone to make his protest after seeing videos of pizza deliveries using drones. My former workplace was also the scene of an unauthorised landing when a drone from the nearby Tokyo MX TV studios mistakenly touched down in the grounds of the British Embassy offices and houses. No offence committed or intended so I believe; it was just a case of pilot error on final approach. It is festival season again in Japan with many local shrines and temples staging events where locals dressed in traditional garb carry portable shrines through the streets and ceremonies are performed in the sacred sites. A group of formally clad priests in Nagano prefecture were very surprised when their procession was interrupted briefly by the arrival of a more modern invention skidding to a halt at their feet. But with typical oriental imperturbability they carried on. In Yoyogi Park, which was last year closed due to an influx of dengue fever carrying mosquitoes, there are now signs banning the use of the mechanical pests. ‘Sankan shion’ means 3 cold days followed by 4 hot days, which is very typical of the weather patterns at this time of year in Japan. In England we just accept it as being ‘normal weather’. Snow is still falling in some parts of the country, bringing with it avalanche warnings for the warmer days. 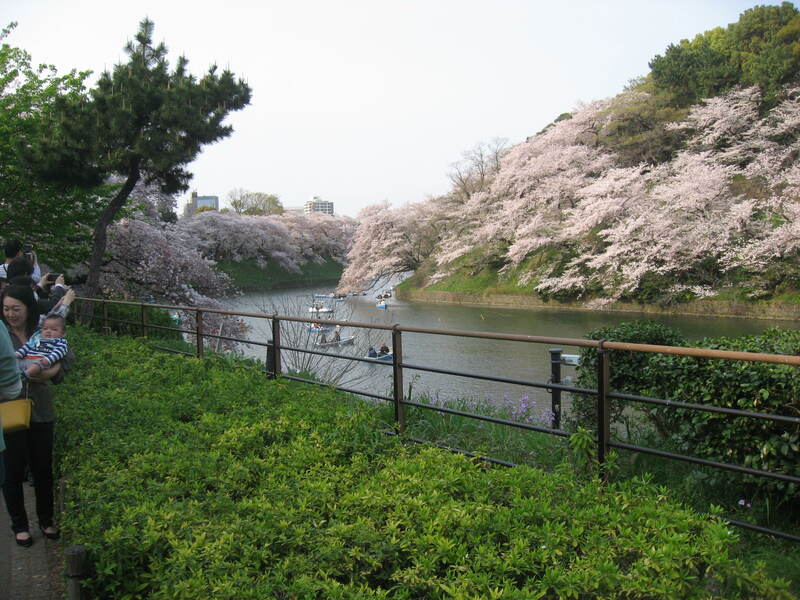 Yet, on the day of the spring equinox (a public holiday), in a country renown for punctuality and efficiency, the first cherry blossom sightings were being reported. In the parks the spring parties are building up already with the earlier plum blossom already in bloom, and the ubiquitous photographers searching for that perfect shot. 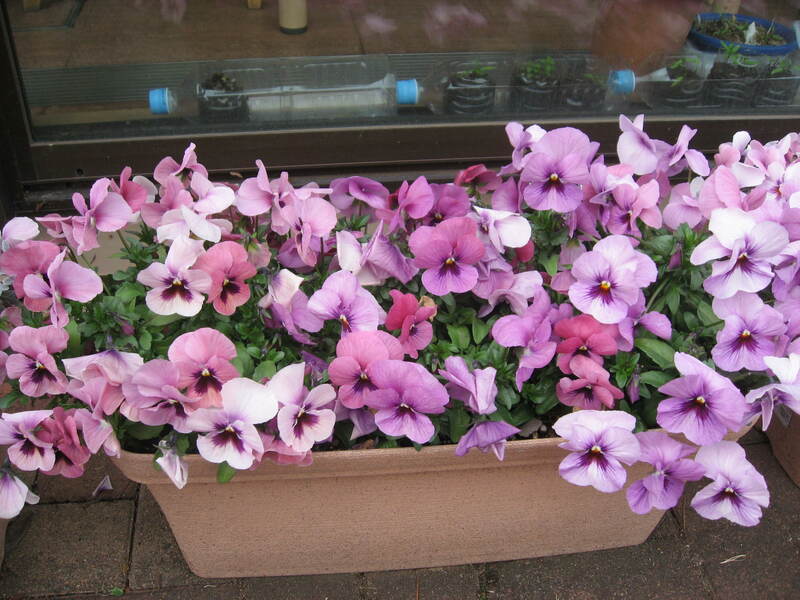 For a nostalgic and often homesick Englishman the sight of boxes of more familiar flowers such as pansies, tulips and daffodils always brings me a little closer to home. In the week of seasonal changes, technological change has also happened with the very last journey of the ‘hokutousei’ (twilight express’) train. It has always been difficult to get tickets for this very popular 16-hour sleeper train service that connects Sapporo in Hokkaido to Ueno in Tokyo, so happy that we were able to have had the experience at least once 5 years ago. On that occasion there were not crowds of train-spotters and well-wishers seeing us off as there were this week for this iconic train’s final journey as it gives way to the equally iconic, but built for the 21st century, shinkansen (bullet train).